Most beef produced in the world is graded for quality. This grading is typically done by a government agency and is considered vital to the beef industry. 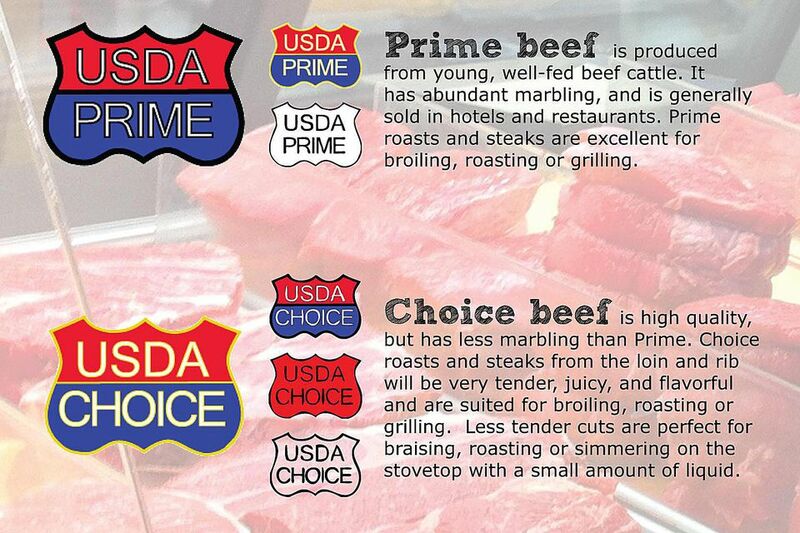 Grading is typically done by a government agency and is considered vital to the beef industry. Not only does grading help ensure the quality of the beef you buy, it is also a powerful marketing strategy for the beef industry. High-grade beef sells for many times the price of lower grade beef. For cattle ranchers, getting a good grade is everything. There are two things that are important to remember about this process. In the United States, grading is voluntary and the people who ask for the grading pay for it. The USDA, who does the grading, is paid by the packers and ranchers who have the grading done. It is as much a marketing tool as a quality check. This is why a lot of beef produced in the United States is sold as ungraded. Prime grade beef is made from young well-fed cattle. It has a high degree of marbling and is both tender and flavorful when cooked. Prime grade makes up a very small (about 2%) of all beef and is generally sold to fine restaurants or in specialty markets. Choice grade is still a very good quality beef but as a little less marbling and will turn out less tender if overcooked. If using a loin or rib cut this will be a great piece of beef. Choice is generally available in many stores but you might have to ask for it or get it from the counter. Select grade beef has a lot less marbling and may be tough and dry if not prepared right. With a select cut, you should really consider a marinade to tenderize and make the meat more flavorful. Select is commonly available in most cuts. Standard and Commercial grades are often sold as "ungraded" or by a store brand. If you don't see a grade name on the meat it could very well be down here. These grades definitely need to be marinated with a good tenderizing agent to make it good enough to eat. Utility, Cutter, and Canner grades are very rarely sold as cut meat. Often it is used for ground beef or in canned products ranging from canned chili to dog food. It's a good idea to ask your butcher about ground beef just to make sure it is made from a better class of meat. You may find that stores do their own marketing by labeling cuts of beef as "prime buy" or "select choice". Remember the golden rule: if you have the slightest doubt, ask. A good and trustworthy butcher is the best friend you'll ever make.